The new solution to the age old tradition of placing dish towels on the counter when hand washing pots, pans, dishes and glassware. Hand washing dishes uses less water than conventional automated dish washers. 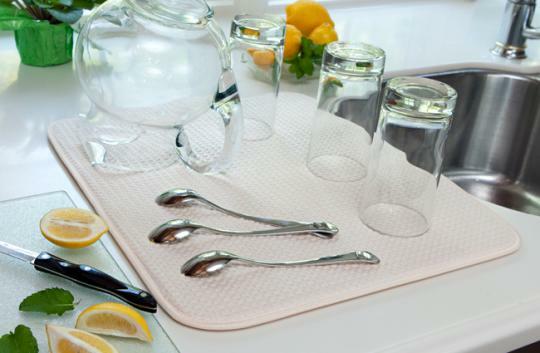 Using the dish drying mat also conserves energy by allowing dishes to air dry. • Can be used in multiple ways including underneath your dish drying rack in place of the plastic drain board. Place it underneath your appliances (mixer, blender, etc.) to protect your counter top from scratches and scuffs. Also cleaning up big spills and messes normally cleaned with paper towels. For best results, allow The Original™ Dish Drying Mat to thoroughly dry between uses. Frequently machine wash, with like colors, in cold water with a liquid detergent, and before first use. Tumble dry low. Do not iron. 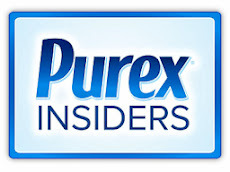 Do not use bleach, fabric softener or dryer sheets. The Original™ Dish Drying Mat should not be used as a pot holder, oven mitt or hot pad. My Impression: I have to say I thought the idea of this product was awesome. To not have to lug out my dish drying bulky plastic bin to lay my dishes in and then in return dry them off. I thought 'The Original Dish Drying Mat' would be great, but sadly it did not impress me that much. It is supposed to soak up a lot of the excess water and though when I shake off the water and lay it on the mat it still soaks up too much of the water and leaves my counter dirty and I don't want my counters to rot so I decided to not use this anymore. Another thing that irritates me is that it is very small and cannot hold a lot of my dishes. When using this I highly suggest wiping these down with a cloth to dry them, but then it is sort of defeating the purpose of what this was intended to do. So, I mean I don't know a lot of you may still love this product I'm just not that happy with it. *This product was sent by Influesnter, but all thoughts and opinions are my own. I used to use this too and had similar results my counter would always get icky really quick. I switched to a simple human dish rack that has a spout it's so much better since the water just goes right back in the sink! I know I don't think they thought the product through when making it. After washing it twice I was like forget this!